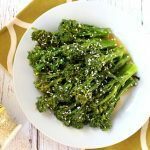 A flavorful and easy side dish, this ginger sesame broccolini is the perfect go-to recipe for nights when you want to enjoy your greens in a way that feels a little more elevated and delicious. To make it a filling entree, consider stirring shredded rotisserie chicken or cooked tofu into the skillet before serving. In our house, sometimes we overdo it on a certain vegetable. And when I say “we,” I mean “I” because I definitely go through phases where I’m 100 percent obsessed with a certain vegetable and make it on repeat until I’m stick of it, Ryan is sick of it and Chase is sick of it. (Ha! “Chase is sick of it.” As though he eats his vegetables all day every day…) Recently it happened with broccoli. It’s so easy to throw in the oven and roast while I’m prepping other parts of dinner and since I know it’s one of Ryan’s favorites and Chase surprisingly loves the raw tops of the florets, I found myself grabbing it over and over again at the grocery store. Well, about a month ago, I found myself feeling like a picky six-year-old at dinner when I felt like I had to eat the broccoli I made because I knew it was good for me. That’s not at all how I like to eat, especially since I LOVE so many vegetables and genuinely enjoy healthy eating. I don’t think it should feel like a chore to get my vegetables in when I sit down to dinner, so I went on a bit of a broccoli hiatus. And now it’s back! But sloooowly… and in the form of thin and tender broccolini. Broccolini is like regular broccoli’s fancy friend. It’s long and lean and beautifully green and usually comes with a heftier price tag, so it’s something I passed over in favor of traditional broccoli. But every once in a while, the fancy broccoli is worth it. Especially when it means I look forward to eating broccoli again! I attribute part of my broccoli rut to the fact that I cooked it the same way again and again. I tossed it in olive oil and some spices and roasted it. I wanted to give broccolini a little extra attention so I swapped my roasting pan for a big skillet and got to work. The end result was the most tender and tasty side dish Ryan and I raved about! It was flavorful and nutty, spiced with the perfect amount of ginger and tender enough to still have a little crunch to it when we took a bite. It’s a great recipe to keep in your back pocket for the evenings when you find yourself needing a little extra motivation when it comes to eating your greens. You can absolutely use it on regular broccoli and it’s a recipe that can easily be transformed into an entrée if you toss it with some shredded rotisserie chicken or cooked tofu before serving. 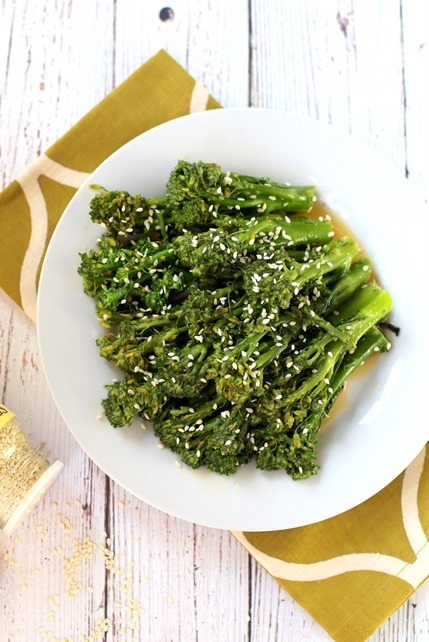 A flavorful and easy recipe, this ginger sesame broccolini is a vibrant side dish that will have you excited to eat your greens thanks to fresh ginger, sesame oil and the salty flavor of coconut aminos. Add approximately 2 cups of water to a skillet so you have 1/4-inch or so of liquid at the bottom. Bring water to a boil. Trim the thick ends off the broccolini. Once the water is boiling in the skillet, add broccolini and allow to cook for approximately 10 minutes, or until broccolini is tender. 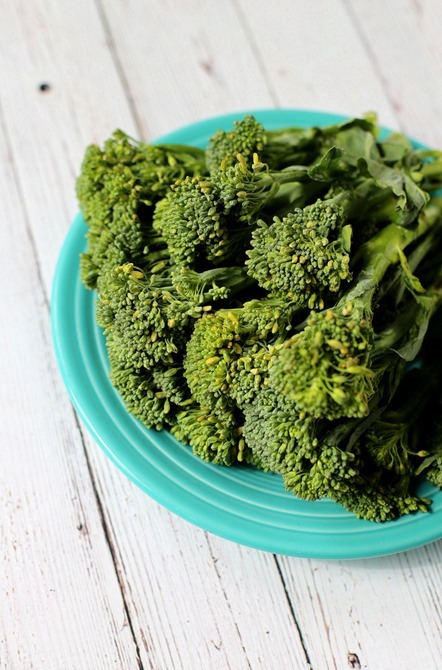 Remove the broccolini from the heat and drain off any remaining water. Add ginger, sesame oil and coconut aminos to the skillet and stir until broccolini is coated. Season with salt and pepper. 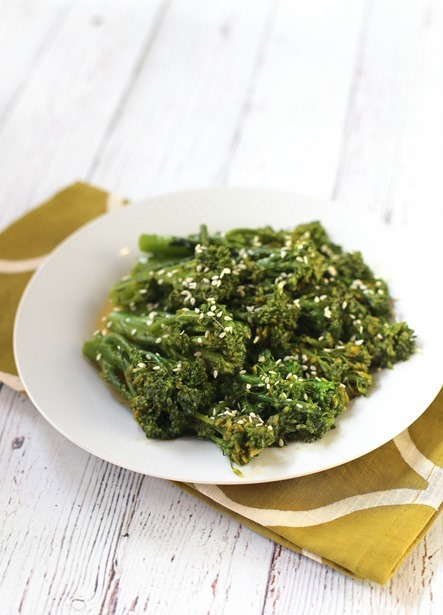 Plate broccolini and sprinkle with sesame seeds before digging in! This would be perfect with salmon! I bet my LO would love this as well. Mmmmm this sounds so good! We do the same with vegetables, I over do it and we get sick of them. But I am always all about broccolini! Yum! I love broccolini, will definitely be giving this a try! This sounds delicious – I love broccolini but don’t buy it very often at all. I’ll be on the lookout for some now. And I love the print feature for your recipes now – makes it very easy! Thank you! Just printed this one out 🙂 I made your marinated pork chop recipe last week and my husband and I really enjoyed it! I need to look into ginger paste, though – grating/mincing fresh ginger always takes me quite awhile! Does the ginger paste that you use have any additional ingredients in it? I’ve never tried broccolini but I have two big heads of broccoli in my fridge so I may swap that in instead to try this recipe. Thanks for sharing and I hope you’re enjoying Hilton Head! Hope you and your family are enjoying your vacation in Hilton Head! This looks delicious!! So flavorful! Looks so simple and delicious. We will have to try it. I love that you have the print option now for your recipes!! So much easier! This meal looks delicious! I love broccolini! One of my favorite things to do with it is put it in a pasta dish with tomatoes and sausage! This looks so delicious! I definitely get in ruts with vegetables – lately green beans because they’re one of the only frozen vegetables I can get to taste good. I have only found broccolini one time in the store. I wish I could find it more often. I am all about easy and delicious recipes! We are big broccoli fans over here which means this recipe must be tried out! This looks deeeelicious!! Perfect side for fall 🙂 I love broccolini! What an amazing recipe with a lovely macronutrient profile! My mother used to make a very similar recipe with just broccoli or cauliflower. It was absolutely divine! I miss home-cooking from university already. The lack of oil and salt in my kitchen just might be the cause of that!